Albert Pujols will be recognized for his service to people with Down Syndrome, and impoverished people in his native Dominican Republic, with the United States Sports Academy’s 2010 Jackie Robinson Humanitarian Award. Jack Scharr, the Academy’s Board of Trustees Chairman of the American Sport Art Museum and Archives (ASAMA), will present the award at the St. Louis Sports Hall of Fame enshrinement ceremony Tuesday, 16 November. 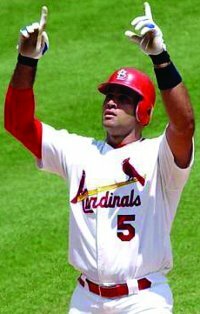 Pujols’ accomplishments in baseball are well known. He is a three-time National League Most Valuable Player and a two-time Major League Baseball Player of the Year. He and his wife, Deidra, whose daughter has Down Syndrome, formed the Pujols Family Foundation (PFF) five years ago, to benefit people with Down syndrome, disabilities, and/or life threatening illnesses, as well as children and families living in impoverished conditions in the Dominican Republic. Raising a child with Down Syndrome had given the Pujols family an understanding of what families in the same situation want and need, therefore the foundation supports a variety of programs to meet these needs. This past month, nearly the entire Cardinal active roster took time off from a pennant race with the Cincinnati Reds to attend the Country Club of St. Albans near St. Louis for the Albert Pujols Celebrity Golf Classic, to raise money for and bring awareness to Foundation projects in the Dominican community of Batey Aleman. The main project, “Batey Baseball,” involves forming a baseball league in the community. Cardinal manager Tony LaRussa, his entire staff, Shaquille O’Neal, Bo Jackson, Bobby Knight and hockey player Barret Jacksman also attended. Representatives of the foundation went on a fact-finding mission to Batey in February to launch the Batey Baseball and “Nest” initiative. Nest is an organization that makes micro-business loans to women in developing countries to create vocational skills and make products for the U.S. market. The Jackie Robinson Humanitarian Award is part of the Academy’s Awards of Sport program, honoring “the artist and the athlete.” It is presented to an individual who has demonstrated a concern for mankind. This individual should exhibit the qualities of dedication, grace under pressure, personal sacrifice, compassion, hope, and dignity that characterize the promotion of human welfare and social reform. Recent winners include 2007 Heisman Trophy winner Tim Tebow, New York Jets running back LaDamian Tomlinson, Tiger Woods, and former NBA star Dikembe Mutombo.